World-renowned musician Sting and his actress-director wife Trudie Styler have become respected members of Tuscany’s deeply-rooted wine community. 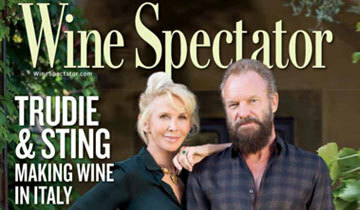 The powerful pair - featured on the cover of Wine Spectator’s April issue, which hits stands March 15 - discuss their journey to transform an idyllic home into a thriving winemaking business. The couple’s long search for real estate in Tuscany ended in 1997 at Il Palagio. Over the years, the couple has restored the house, replanted its vineyards and launched a boutique winery based on biodynamic and organic principles. Though Sting and Styler make no pretense of being winemakers, their stewardship has given new life and prestige to an estate that formerly produced bulk wines. Their team has produced outstanding wines, and Sting and Styler have become part of the local community. Il Palagio - which continues to grow, both as an estate and a brand—has become a gathering place. The estate often hosts the couple’s families and friends, along with musicians, actors, film and theater producers, philanthropists and intellectuals. It’s also a place for Sting to think, get inspired, bring people together and play music, as he has recorded five albums in its attic studio. On April 9, Il Palagio will be one of 100 producers selected by Wine Spectator to participate in OperaWine: Finest Italian Wines, the marquee event of Vinitaly, Italy’s largest wine fair.